This new Handbook provides a series of reference guides to cleaner production methods, technologies, and practices for key industry sectors. 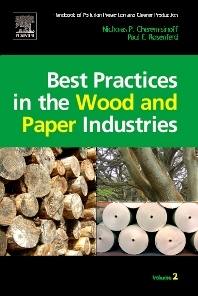 Best Practices in the Wood and Paper Industries provides an overview of the forestry, wood preserving, pulp and paper industries and identifies the key environmental aspects, supported by case studies of major incidents. It provides general explanations of the major unit operations and processes in pulp and paper mills and wood treating plants, covering new trends alongside traditional methods. The environmental issues regarding air, water and solid waste are all addressed, identifying all US plants and their TRI data, and the authors provide calculation methods for properly accounting for air emissions and P2 practices to reduce them. Nicholas P. Cheremisinoff, Ph.D. (Ch.E.) is Director of Clean Technologies and Pollution Prevention Projects at PERI (Princeton Energy Resources International, LLC, Rockville, MD). He has led hundreds of pollution prevention audits and demonstrations; training programs on modern process design practices and plant safety; environmental management and product quality programs; and site assessments and remediation plans for both public and private sector clients throughout the world. He frequently serves as expert witness on personal injury and third-party property damage litigations arising from environmental catastrophes. Dr. Cheremisinoff has contributed extensively to the literature of environmental and chemical engineering as author, co-author, or editor of 150 technical reference books, including Butterworth-Heinemann’s Handbook of Chemical Processing Equipment, and Green Profits. He holds advanced degrees in chemical engineering from Clarkson College of Technology."